Today we have a very special blog book review for sitcom fans and John Ritter fans. 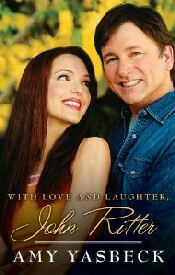 With Love and Laughter, John Ritter is actress Amy Yasbeck's most enduring memory of the life she shared with her husband, John Ritter. He was one of America's most popular and beloved film and television actors and no stranger to this website. We welcomed him into our homes weekly with his Emmy Award-winning portrayal of Jack Tripper on Three's Company and his hit comedy 8 Simple Rules for Dating My Teenage Daughter, along with many many other roles. In this powerful memoir Amy Yasbeck shares her deeply personal and ultimately hopeful journey of surviving the devastating loss of her husband. Yasbeck looks back with anecdotes and memories from both John's life and her own. Here are the unforgettable times she shared with a man who was adored for finding humor in everyday encounters, never failing to energize and entertain everyone around him. His philosophy was summed up by his favorite autograph for his fans, With Love and Laughter, John Ritter. Amy Yasbeck's powerful story reminds us that love never dies...and the laughter doesn't have to end. With Love and Laughter, John Ritter - by Amy Yasbeck (Simon & Schuster, $26.00) was how John Ritter usually signed autographs and now it will be a hit book! In this wonderful, loving, funny and sad book, we get personal stories and details from life of John Ritter in the words of his wife, Amy Yasbeck. There are all kinds of very interesting and detailed stories in this book and the book has about 249 pages, but you breeze right through it because it is very well-written and so enduring. You can't put it down and I'm sure when you all get it, you'll see why. Amy does a very good job in the writing and picks the perfect stories. We get personal stories from both her life before John and with John. And of course we get stories from some of John's acting work. We all know he was the nicest guy and Amy proves that even more with her stories. The man was also very smart. John was of course funny, caring, nice and smart. You'll see all those qualities in these stories. The book has twenty-six chapters, but of course there is no chapter thirteen. Amy hilariously notes that actors are superstitious, so chapter thirteen is a no-no! Ha that number thirteen is to be feared! There is also a seven-page pre-face before chapter 1. The book starts off with some background information on John's childhood life in chapter one and in chapter two we get info on Amy's childhood life in Ohio. The next chapter delves into John's early roles guest starring on shows like Kojak. Amy gives us a hilarious story from that role, when they caught a rerun of that episode in 1997. Chapter four is titled "Daddy No Beard." That is what his daughter Stella called him whenever she saw a rerun of Three's Company on Nick at Nite. Stella was used to the bearded John Ritter. Even Stella is funny! This chapter discusses Three's Company. The next chapter has Amy detailing her move to New York in 1983. I never knew about this story at all, so it was very fascinating. We get a taste of how Amy got into "the business." Chapter six is titled "Icon Tact." Among the items discussed in this chapter are why John Ritter never hosted Saturday Night Live, despite being offered to host it. The next chapter we get more of Amy's early work and then in chapter eight is where Amy meets John on September 25, 1989 at Dennis Dugan's house. Dugan directed the feature film Problem Child, which starred both John and Amy. In Chapter nine, we move into the 1990's! 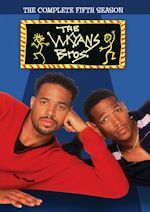 The chapter starts off with John and Amy's guest appearance on The Cosby Show. We get so many behind-the-scenes stories here. The chapter also highlights stories from Hearts Afire, where John met his good buddy Billy Bob Thornton. 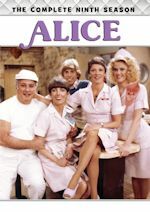 Without detailing every chapter, the best of the book has great stories like Amy on Wings, John working with Andy Griffith on the TV-movie Gramps (Amy also worked with Andy on Matlock), their summer trip in Italy & France in 1996, going to Elizabeth Taylor's house in 1997, more of John's TV movies like Last Man on the List & Holy Joe, the cool stories and treatment at World's Greatest Magic IV, the birth of Stella and why they named her Stella, the marriage, the play The Dinner Party with Henry Winkler, a hilarious recall on Henry & John's early 90s TV movie The Only Way Out, living in New York in 2000, Clifford the Big Red Dog, 8 Simple Rules and John's final day. There are also over 25 nice color photos in the middle of the book, from John & Amy in Venice, Hawaii, with Stella, and more! The last few chapters talks about life after John, including the Ritter Rules, which are life-saving reminders to recognize, treat, and prevent thoracic aortic dissection. The John Ritter Foundation for Aortic Health is saving so many lives and is a great tribute to John Ritter. In the book, Amy also mentions in detail on how John's brother Tom was saved from an aortic dissection. This foundation is truly saving lives and will for many years to come! Chapter twenty-six is titled, "John But Not Forgotten," and he certainly will never be forgotten. It's Friday, so it is time for "Sitcom Stars on Talk Shows" for the coming week. 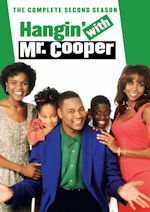 This is where we list what sitcom stars are appearing on talk shows for the coming week, the stars are both current and past sitcom stars (but we won't cover movie stars like Tom Hanks or John Travolta, since they won't be talking about their past sitcoms likely), so this is for all sitcom fans of all eras! For the week of Sept. 6-10, 2010, we have many current sitcom stars and past sitcom stars on TV talk shows! So get your DVR's (or whatever you use) ready! Ready? Here is all what you need to know for the coming week! John Larroquette (Night Court/John Larroquette Show/Happy Family) - Catch John on Late Late Show with Craig Ferguson at 12:35am on CBS. The Cast of The Game - Watch the cast of the sitcom on this repeat of The Mo'nique Show on BET at 11pm! Chris Kattan (The Middle) - Catch Chris on an all-new Late Late Show with Craig Ferguson at 12:35am on CBS. Mario Lopez (Saved by the Bell) - Watch Mario on a repeat of The Rachel Ray Show, so check your listings. Kevin Nealon (Weeds) - Kevin appears on Jimmy Kimmel Live! at 12:05am on ABC. Jerry O'Connell (Carpoolers) - Catch Jerry on Late Late Show with Craig Ferguson at 12:35am on CBS. Terry Crews (Are We There Yet?) - Watch funnyman Terry on a repeat of The Mo'nique Show on BET at 11pm! Donal Logue (Knights of Prosperity/Grounded for Life) - Catch Donal on an all-new Jimmy Kimmel Live! at 12:05am on ABC. 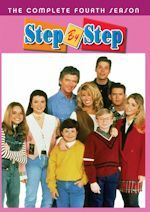 The Cast of The Brady Bunch - Catch some of the stars (Susan Olsen, Mike Lookinland, and Christopher Knight) reuniting for Lloyd Schwartz's book Brady, Brady Brady on Good Morning America on ABC sometime between 7-9am. Sofia Vergara (Modern Family/Knights of Prosperity/Hot Properties) - Watch Sofia on a repeat of The Ellen DeGeneres Show so check your local listings. Eric Stonestreet (Modern Family) - Catch the Emmy winner on ABC's Good Morning America sometime between 7-9am! Dun dun...hey hey! Donald Glover (Community) - Watch Donald on Late Late Show with Craig Ferguson, at 12:35am on CBS! Katey Sagal (8 Simple Rules/Married...with Children/Tucker) - Catch Katey also on Late Late Show with Craig Ferguson at 12:35am on CBS! Donal Logue (Knights of Prosperity/Grounded for Life) - Donal continues his rounds, this time on Tavis Smiley on PBS. Check your listings for time. Danny DeVito (It's Always Sunny in Philadelphia/Taxi) - Catch Danny on The View on ABC at 11am ET/10am CT-PT. John Corbett (United States of Tara) - Catch John on a repeat of The Ellen DeGeneres Show, so check your listings. Nick Offerman (Parks and Recreation/George Lopez) - Watch Nick on a repeat of Last Call with Carson Daly at 1:35am on NBC. This show is always in repeats!